See our web page for more information and a set of useful examples. I can't thank the developer enough for making this available, and for free. It's intuitive, it works very well, and it makes parsing JSON in Applescript possible with ease, when it would have been either impossible or a complete nightmare without it. Thanks David! I've been looking for something to parse JSON from within some AppleScripts we use, and this does the trick. Very good. 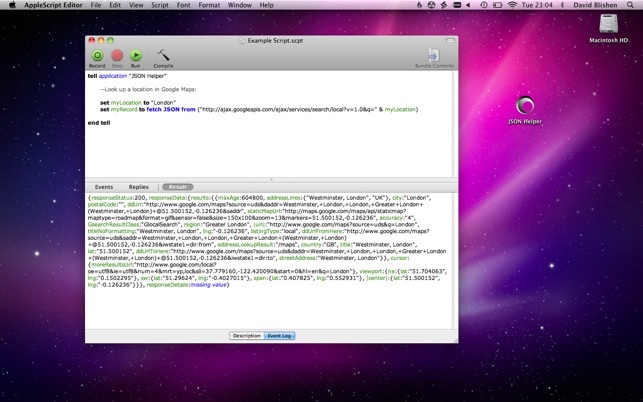 A really handy app for parsing/creating JSON using AppleScript. Very easy to use too. Saved me heaps of time. Thanks very much!